SACRE BLEU! The 2010 PopcornBiz Cannes Film Festival Preview! It’s so unfair. I dream one day of having a movie to show at this glorified press junket. I don’t even care if the movie is good. I just want a free week in Cannes to quaff wine by the gallon and eat platter after platter of mussels. EVERYONE THERE LOOKS SO HAPPY! I fail to see why movie stars are the only people allowed to horn in on the action. The Tree Of Life: I have more on this movie in another post, but legendary director Terence Malick may be showing his new movie (starring Brad Pitt) if it’s completed in time. Fair Game: No, it’s not the Cindy Crawford/Billy Baldwin masterpiece. This is Doug Liman’s take on the Valerie Plame affair, starring Naomi Watts. But who’s to say Cindy Crawford can’t show up in a cameo? You know it’s the right thing to do. Biutiful: Mexican director Alejandro Gonzalez Inarritu (“Amores Perros,” “Babel”) brings his latest (with Javier Bardem) to the French Riviera. I fully expect to be depressed and confused simultaneously. Wall Street 2: Money Never Sleeps: The Michael Douglas sequel will be screened out of competition, and at last we’ll have a definitive answer to the “Wait, does this look awful, or awful in an entertaining way?” question we’ve all been asking ourselves. You Will Meet A Tall Dark Stranger: It’s the latest from Woody Allen, and we’ll see if he can keep up the winning streak he began here with “Match Point.” I’m no Woody fan, but that movie was fantastic. 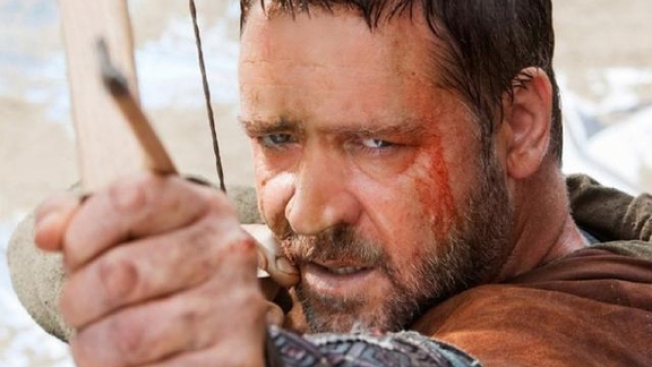 Robin Hood: Ridley Scott and Russell Crowe join forces for this movie, which looks like “Gladiator” with arrows. In other words, it looks awesome. Of course, the joy of Cannes is finding out which movie comes from out of nowhere to dazzle everyone, and which movie will be greeted with French people booing and storming out of the theater (“Brown Bunny 2!”). But already, this year’s festival looks mighty promising. If I only you and I could get an invite.